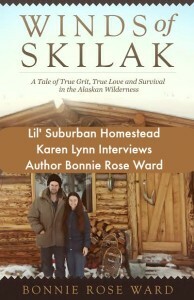 Karen Lynn has a special guest on her show this week Bonnie Rose Ward Author of The Winds of Skilak “A tale of True Grit, Love, and Survival In The Alaskan Wilderness”. We will hear all about Bonnie and her husband Sam’s adventures in the off-grid Alaskan wilderness away from modern day conveniences such as phones, grocery stores, medical care just to name a few. The Alaskan wilderness many have gone and few have stayed in particular as Bonnie alluded to in the book women would go to Alaska but often would not stay. The temperatures get extremely cold and roads, lakes, and travel ways are extremely treacherous to travel. Today in Anchorage Alaska it is 6 degrees Fahrenheit and the freezing conditions makes it dangerous to even go outside for any length of time without becoming frost bitten but Bonnie and her husband Sam lived in tents for a good part of their stay and a hot shower or a visit with another female for Bonnie was a luxury item and rare! Bonnie will share about the hardships they endured, the independence they found and the adventure that was their life! Karen Lynn also has a book review here at her blog regarding this fabulous winter read as she calls it but mostly because she’s on Winter Break! It’s not to late to enter the giveaway for your very own copy HERE! Could you survive in the Alaskan Wilderness? Would you like to live a self-reliant lifestyle? Do you think you could go off-grid? Whether you would like to live off-grid or just want to live life vicariously through Bonnie and Sam this Radio Show is going to be an Adventure for all who listen! You will hear tales of Bears, Cold Water That Kills, Cabin Fever, and even gold! Book Review & Giveaway for Bonnie’s show HERE! Visit Winds of Skilak website HERE! 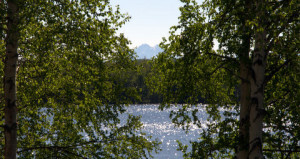 Listen to this broadcast on “The Alaskan Wilderness, Could You Survive? in player below! Previous: Previous post: Growing Power and Will Allen!